This material goes beyond the Initiation Phase of Molecular Biology, Part I. 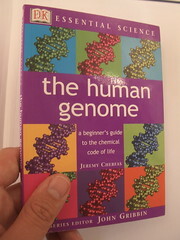 Part II reviews the Human Genome Project and the decade beyond. Part III will conclude with Ubiquitin, it’s Role in Signaling and Regulatory Control. creation of a new science of Molecular Biology. Part II follows the race to delineation of the Human Genome, discovery methods and fundamental genomic patterns that are ancient in both animal and plant speciation. But it explores both the complexity and the systems view of the architecture that underlies and understanding of the genome. developments in applied mathematics that have transformed the research framework. A NOVA interview with Francis Collins (NHGRI) (FC), J. Craig Venter (CELERA)(JCV), and Eric Lander (EL). RK: For the past ten years, scientists all over the world have been painstakingly trying to read the tiny instructions buried inside our DNA. And now, finally, the “Human Genome” has been decoded. EL: The genome is a storybook that’s been edited for a couple billion years. EL: In the nucleus of your cell the DNA molecule resides that is about 10 angstroms wide curled up, but the amount of curling is limited by the negative charges that repel one another, but there are folds upon folds. If the DNA is stretched the length of the DNA would be thousands of feet. EL: We have known for 2000 years that your kids look a lot like you. Well it’s because you must pass them instructions that give them the eyes, the hair color, and the nose shape they have. RK: Cracking the code of those minuscule differences in DNA that influence health and illness is what the Human Genome Project is all about. Since 1990, scientists all over the world have been involved in the effort to read all three billion As, Ts, Gs, and Cs of human DNA. It took 10 years to find the one genetic mistake that causes cystic fibrosis. Another 10 years to find the gene for Huntington’s disease. Fifteen years to find one of the genes that increase the risk for breast cancer. One letter at a time, painfully slowly… And then came the revolution. In the last ten years the entire process has been computerized. The computations can do a thousand every second and that has made all the difference. EL: This is basically a parts list with a lot of parts. If you take an airplane, a Boeing 777, I think it has like 100,000 parts. If I gave you a parts list for the Boeing 777 in one sense you’d know 100,000 components, screws and wires and rudders and things like that. But you wouldn’t know how to put it together, or why it flies. We now have a parts list, and that’s not enough to understand why it flies. Projects supported by the US National Institutes of Health will have produced 68,000 total human genomes — around 18,000 of those whole human genomes — through the end of this year, National Human Genome Research Institute estimates indicate. And in his book, The Creative Destruction of Medicine, the Scripps Research Institute’s Eric Topol projects that 1 million human genomes will have been sequenced by 2013 and 5 million by 2014. Daniel MacArthur, a group leader in Massachusetts General Hospital’s Analytic and Translational Genetics Unit estimates that “From a capacity perspective … millions of genomes are not that far off. If you look at the rate that we’re scaling, we can certainly achieve that.” The prospect of so many genomes has brought clinical interpretation into focus. But there is an important distinction to be made between the interpretation of an apparently healthy person’s genome and that of an individual who is already affected by a disease. In an April Science Translational Medicine paper, Johns Hopkins University School of Medicine‘s Nicholas Roberts and his colleagues reported that personal genome sequences for healthy monozygotic twin pairs are not predictive of significant risk for 24 different diseases in those individuals. The researchers concluded that whole-genome sequencing was not likely to be clinically useful. Ambiguities have clouded even the most targeted interpretation efforts. a lack of community-wide standards for the task. have hampered researchers’ attempts to reliably interpret the clinical significance of genomic variation. How signals from the cell surface affect transcription of genes in the nucleus. After graduation from Washington University School of Medicine he worked with Francois Jacob at the Pasteur Institute in Paris and served as Vice President for Academic Affairs at Rockefeller in 1990-91. He is the coauthor with S.E. Luria of General Virology and the founding author with Harvey Lodish and David Baltimore of Molecular Cell Biology, now in its sixth edition. His book RNA, Life’s Indispensable Molecule was published in July 2011 by Cold Spring Harbor Laboratory Press. A member of the National Academy of Sciences since 1973, recipient of numerous awards, including the 2003 National Medal of Science, the 2002 Albert Lasker Award. bind DNA and drive transcription. persistent activation of STAT3 that occurs in a high proportion of many human cancers contributes to blocking apoptosis in cancer cells. Current efforts are devoted to inhibiting STAT3 with modified peptides that can enter cells. through which cells sense and respond to DNA damage and replication stress. a critical regulatory step in tumorigenesis. isolate several members of the Cdk2-inhibitory family. proteome remodeling through ubiquitin-mediated proteolysis. marking them with ubiquitin for destruction by the cell’s proteasome machinery. which controls regulated protein stability in eukaryotes. genes upon which cancer cells uniquely depend for survival. how cells respond to DNA damage. By using these tools, he and his colleagues have identified multiple genes involved in cell-cycle regulation. the first members of which were the umuCD genes in E. coli. It was then that he developed a new cloning tool. Elledge invented a technique that allowed him to approach future cloning problems of this type with great rapidity. With the new technique, “you could make large libraries in lambda that behave like plasmids. We called them `phasmid’ vectors, like plasmid and phage together”. The phasmid cloning method was an early cornerstone for molecular biology research. these genes are regulated by the cell cycle. many human genes could be isolated by looking for complimentary genes in yeast. Cdk2 controlled the G1 to S cell-cycle transition, a step that often goes awry in cancer. These results were published in the EMBO Journal in 1991.
identify genes involved in sensing and responding to DNA damage. signal transduction pathways in both yeast and humans that recognize damaged DNA and replication problems. prevention of genomic instability and a key to understanding tumorigenesis. This contribution is part of the special series of Inaugural Articles by members of the National Academy of Sciences elected on April 29, 2003. Defective cardiovascular development and elevated cyclin E and Notch proteins in mice lacking the Fbw7 F-box protein. Fbw7 studies suggest that it may be a tumor suppressor. To generate an in vivo system to assess the consequences of such unregulated signaling, we generated mice deficient for Fbw7. Fbw7-null mice die around 10.5 days post coitus because of a combination of deficiencies in hematopoietic and vascular development and heart chamber mutations. The absence of Fbw7 results in elevated levels of cyclin E, concurrent with inappropriate DNA replication in placental giant trophoblast cells. Moreover, the levels of both Notch 1 and Notch 4 intracellular domains were elevated, leading to stimulation of downstream transcriptional pathways involving Hes1, Herp1, and Herp2. These data suggest essential functions for Fbw7 in controlling cyclin E and Notch signaling pathways in the mouse. the epigenome begins to take over during the later stages of embryogenesis. Beginning as a fertilized single egg that egg becomes many different kinds of cells. Altogether, multicellular organisms like humans have thousands of differentiated cells. Each is optimized for use in the brain, the liver, the skin, and so on. Remarkably, the DNA inside all these cells is exactly the same. What makes the cells differ from one another is that different genes in that DNA are either turned on or off in each type of cell. Take a typical cell, such as a red blood cell. Each gene within that cell has a coding region that encodes the information used to make a particular protein. (Hemoglobin shuttles oxygen to the tissues and carbon dioxide back out to the lungs—or gills, if you’re a fish.) But another region of the gene, called “regulatory DNA,” determines whether and when the gene will be expressed, or turned on, in a particular kind of cell. This precise transcribing of genes is handled by proteins known as transcription factors, which bind to the regulatory DNA, thereby generating instructions for the coding region. One important class of transcription factors is encoded by the so called homeotic, or Hox, genes. Found in all animals, Hox genes act to “regionalize” the body along the embryo’s anterior-to-posterior (head-to-tail) axis. In a fruit fly, for example, Hox genes lay out the various main body segments—the head, thorax, and abdomen. Amazingly, all animals, from fruit flies to mice to people, rely on the same basic Hox-gene complex. Using different-colored antibody stains, we can see exactly where and to what degree Hox genes are expressed. Each Hox gene is expressed in a specific region along the anterior-to-posterior axis of the embryo. Hox genes must be expressed in a precise way and at precise times. and is “on” in the haltere disk. Now you’ll see what happens when the Ubx gene—just one of a large number of Hox genes—is turned off in the haltere disk. What if a genetic mutation caused the Ubx gene to be turned off, during the larval stage, in the third thoracic segment, the segment that normally produces the haltere? Instead of a pair of halteres, the fly has a second set of wings. With the switch of that single Hox gene, Ubx, from on to off, the third thoracic segment becomes an additional second thoracic segment and the pair of halteres became a second pair of wings. This illustrates the remarkable ability of transcription factors like Ubx to control patterning as well as cell type during development. As part of a huge collaborative effort called ENCODE (Encyclopedia of DNA Elements), a research team led by Cold Spring Harbor Laboratory (CSHL) Professor Thomas Gingeras, PhD, publishes a genome-wide analysis of RNA messages, called transcripts, produced within human cells. only the small protein-encoding fraction of the genome was transcribed. – that is, the copying of DNA and the making of proteins is based on information carried by messenger RNAs. With the understanding that so much of our DNA can be transcribed into RNA comes the realization that there is much less space between what we previously thought of as genes, Gingeras points out. ENCODE was designed to pick up where the Human Genome Project left off. and nearly 400,000 ‘enhancer’ regions that regulate expression of distant genes (see page 57)1. But the job is far from done. Junk DNA? What Junk DNA? proteins interact with the DNA to control gene expression. a regulatory element for one gene may be located quite some ‘linear’ distance from the gene itself. noncoding DNA plays in disease development. 2013 Genomics: The Era Beyond the Sequencing of the Human Genome: Francis Collins, Craig Venter, Eric Lander, et al.